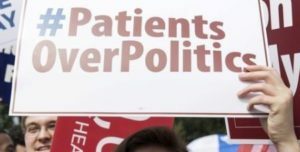 “In 2014, Governor Brownback gladly signed legislation relinquishing authority for expanding KanCare over to the Kansas Legislature. He refused to take any further action on the issue because he said it was the legislature’s responsibility. A bipartisan majority of both legislative chambers have now endorsed the expansion of KanCare. It is deeply disappointing to see Governor Brownback obstruct the will of the people on such an important issue for the second time this session. After contentious debate in the Kansas House of Representatives, a motion to over-ride the Governor’s veto has been tabled to give citizens an opportunity to weigh in on the issue. We strongly encourage you to take this opportunity to contact your representatives in both the House and Senate and urge them to vote to OVER-RIDE the Governor’s veto on medicaid expansion. You can find your representatives and contact them by CLICKING HERE. After Chairman Campbell’s promise to work today until a new school finance formula has been created, the K-12 Budget Committee has been doing just that. At this hour, there has been much debate around a slew of amendments. 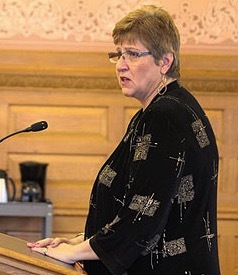 Notably, Rep. Brenda Landwehr suggested in a stern tone that the Supreme Court of Kansas hasn’t suggested that more money is needed to solve adequacy. Instead, she suggested that a more efficient distribution of funding was in order and would satisfy the court order. Landwehr went on to state that Catholic schools do better than public schools with less money spent and that “how you teach and approach students is more important than money.” Few would argue that teaching and learning successes come from dedicated professional educators and engaged students, but as the Supreme Court has noted time and again, the state (most recently with Brownback’s CLASS Act) has not been supporting public education equitably or adequately. Returning to the prior formula on high density at-risk. As we write this, amendments are still being offered and the debate continues. We expect this committee to be working late into the night. We will post a full report in tomorrow’s edition of Under the Dome.